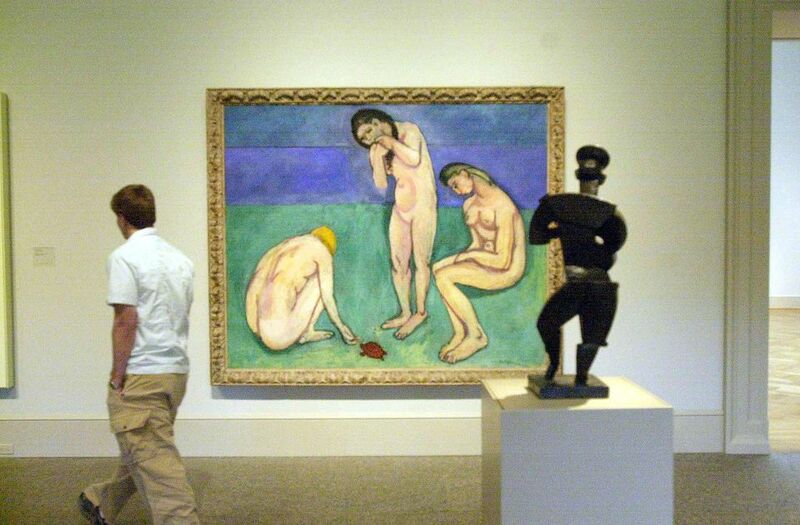 The St. Louis Art Museum attracts art lovers from around the country. The museum's collections and special exhibits showcase a wide variety of paintings, sculptures and more. The museum also hosts many family-friendly events throughout the year. The Art Museum is one of the top free attractions in St. Louis. For more information on places to visit without spending money, see The Best Free Attractions in the St. Louis Area. The St. Louis Art Museum is located on Fine Arts Drive the heart of Forest Park, near the St. Louis Zoo. The museum sits at the top of Art Hill. It is open Tuesday through Sunday from 10 a.m. to 5 p.m., with extended hours until 9 p.m., on Friday. The museum is closed on Thanksgiving and Christmas Day, but it is open on New Year's Day. General admission is free. Admission to the special exhibits is also free on Friday. The Art Museum is filled with world-class works of art from around the globe. There are more than 30,000 works in the museum's permanent collection. That includes works by masters like Monet, Van Gogh, Matisse, and Picasso. The museum is also home to a well-known collection of 20th-century German art, including the world's largest collection of paintings by Max Beckmann. As a general guide, the European masters are located in the museum's main level, along with any special exhibits. Most of the modern and contemporary works are in the upper level. The lower level contains African and Egyptian art. In addition to the exhibits and galleries, the Art Museum is a good place to find free, family-friendly events and activities throughout the year. Each Sunday afternoon, the museum hosts Family Sundays from 1 p.m. to 4 p.m, in the Sculpture Hall on the main level. The event includes hands-on art activities for kids and a family tour of the museum at 2:30 p.m. There are different themes for Family Sundays based on the exhibits currently on display at the museum. For a more adult-oriented event, the museum hosts an Outdoor Film Series on Friday nights in July. The movies are shown on a large screen on Art Hill. The event begins at 7 p.m., with music and local food trucks. The movies start at 9 p.m. The St. Louis Art Museum recently underwent a large expansion project. The newer 200,000 square foot expansion contains additional room for galleries, a new entrance, and more than 300 parking spaces. The project was completed in June 2013. For more information on the expansion, see the St. Louis Art Museum website.